In April 1871, a colony of some 60 families from Ripon, Wisconsin, took up residence at Fossil Station, a water stop on the Union Pacific Railroad. These early settlers came to the area seeking a better way of life. A place where they could work, play and raise their families. Russell and Russell County was named for Avra P. Russell. He became recognized for raising a company for the Second Kansas Infantry, was elected First Lieutenant, commissioned by Governor Robinson and rose to Captain under President Lincoln. Unlike many of the surrounding communities, Russell was not settled by immigrants from one country, but rather by settlers of mixed European descent coming from the eastern United States. Many of them were immigrants moving west in search of a better life and brought with them their cultural heritage from such places as Bohemia, Volga Russia, Germany, England, Ireland, and Wales. Russell is truly an American "melting pot" of cultural backgrounds which is recognized and celebrated not only in our decennial celebrations, but through our daily lives creating a comfortable, mid-western community, ready to welcome visitors. 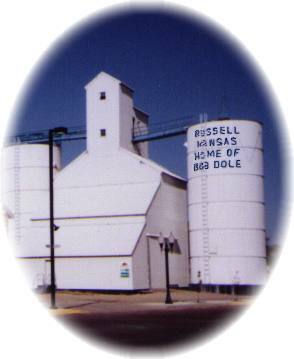 Russell is the boyhood home of Senator and Presidential Candidate, Bob Dole. President Gerald R. Ford and Senator Robert J. Dole launched the 1976 Presidential campaign on this site on August 20, 1976.